"First of all, in Wisconsin we are thrilled SPRING HAS ARRIVED. Of course it is arriving in the disguise of winter!" The life and times of a leader in Special Education are busy ALL the time but perhaps no time is AS busy as the spring! With personnel issues, placement and eligibility reconsiderations, budget, retirements, hiring, and just generally closing one year while planning for the next it is a tough time. But when I ran across the quote above from Henry Wadsworth Longfellow, it made me stop and think. One of the biggest reasons I became a member and stayed a member of CEC, CASE, and my state affiliate, was because of the critical opportunities those organizations gave me to have many "conversations across the table with a wise man" and/or woman! Sometimes those conversations were at VERY busy times--most of those conversations were at VERY busy times. But the benefit I got from those colleagues was priceless! 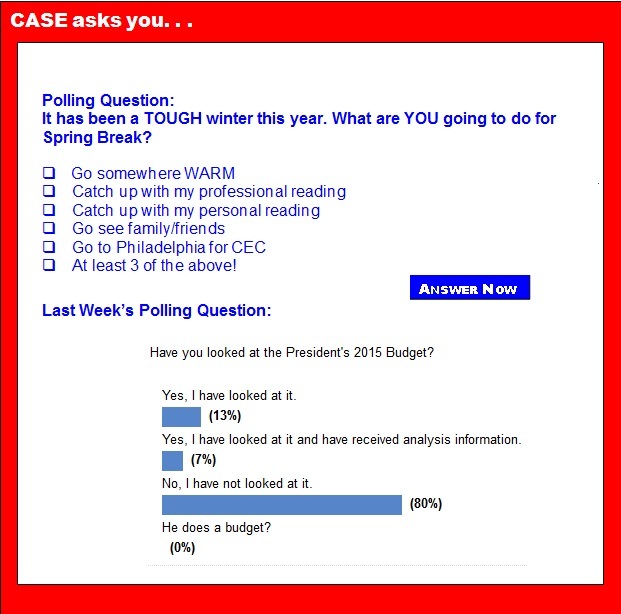 I hope you will take time out of your VERY busy spring to sit across the table from some very wise men and women in Philadelphia at the CASE activities at CEC! Speaking of "table time," have you made your plans to attend CEC and all of the CASE events! There will be plenty of table time with great "wise" men and women at these opportunities. Make sure your plans include you arriving so you can attend the CASE member/board meeting on Wednesday, April 9. We will begin with a great, full breakfast buffet, sponsored by eSped at 7:30-8:30 and then the meeting starting at 8:30 and going until about 4:00. Awards will be sponsored by Stetson & Associates. We always have an awesome break in the afternoon and this year it is sponsored by Scholastic, Inc. During the annual member meeting we will be having an update on policy issues by the CEC Policy and Advocacy unit, hearing about the upcoming membership changes from the CEC Membership unit, hearing the results of the CASE election, and providing input to the CASE leadership on the upcoming projects and possible projects. Once again, this year our Showcase session will be on Thursday morning and will be Julie Weather, Esq with her great legal update! The Showcase will be sponsored by Scholastic, Inc. If you have attended this session in the past, you know we always run out of room. I don't think we will this year — CEC has scheduled us in a great lecture hall that seats 600 people so invite everyone to come hear this great speaker. Her handout alone will be worth the effort! CASE Night, co-sponsored by C8Science and Star Autism Support, is going to be a great event as always this year! Just think, heading out to the ballpark with 174 of your colleagues on Thursday, April 10, 2014 for food and a great ballgame! We will have appetizers, dinner, cash bar and lots of fun at a pregame tent party at the Citizens' Bank Park and then we will be sitting together for the Phillies vs. Brewers game! Click here for the flyer and click here to purchase your tickets! CASE NIGHT sells out almost every year ... don't delay on getting your ticket! Did you know that CASE has been presenting a great session for the last 5 years on What Every Aspiring SPED ADMIN Needs to Know at the CEC Convention? Goal 3 of the CASE strategic plan states, "CASE will be active in the development and mentorship of special education administrators. The CASE leadership realized that what better opportunity to "expose" teachers to the joys and "how to" of the special education administration career ladder than at the CEC convention. So, if you have teachers attending CEC who would benefit from this great session, please encourage them to attend and if you are available at that time (Friday, April 11 10:30-11:30 room 204C in the convention center) come join us. It is always a well attended, exciting session filled with encouragement as we see ourselves as we were a "few" years ago! Lots of exciting things going on at CEC — See you in Philadelphia! Cognitive development programs have been recognized as an exemplary resource for providing organizational help for students with ADHD and other cognitive deficits. These professional development programs are designed to help educators understand how cognitive skills impact student learning, how to implement an effective cognitive training program, how to interpret and use the data to differentiate instruction and facilitate the success of students with ADHD or other cognitive deficits. Many of the problems that teachers see in the classroom such as lack of attention, focus, working memory or behavior problems can be attributed to a specific lack in one of the eight core cognitive capacities. However, understanding those core capacities, identifying them and then using that information to differentiate instruction can seem pretty overwhelming. These professional development programs were designed to make that process simple for all educators. They will give educators a better understanding of the eight core cognitive capacities how they affect student learning and how they can implement cognitive training that will give them all the tools they need to have an impact on student success. The cognitive training program introduced in these programs was designed and developed by a leading neuroscientist in an NIH funded research program at Yale Medical School and recently won the NIH Director's Award for "high impact, high innovation, and paradigm changing medical research." To take advantage of this cutting edge professional development in your district click here. The Osceola School District is accepting applications for a full time School Psychologist starting with the 2014-2015 school year. The School Psychologist will play an integral role in Response to Intervention and special education evaluations/support. This is a 192 day position. The Osceola School District is located approximately 50 miles northeast of the Twin Cities Metro Area, in the beautiful St. Croix River Valley. Recently, a group of 26 nationally recognized experts from the social science, education and legal fields — known as the Discipline Disparities Research-to-Practice Collaborative — unveiled a collection of resources that call for changes to discipline policies. CEC Congratulates Michael Yudin of the U.S. Department of Education who was elected as the new Chair to the Access Board on March 12. As Acting Assistant Secretary for Special Education and Rehabilitative Services, Yudin serves as the Secretary of Education's principal adviser on special education, vocational rehabilitation, and disability and rehabilitation research. The U.S. Department of Education announced the start of the $134 million 2014 Investing in Innovation grant competition for pre-applications for the i3 "Development" grants (up to $3,000,000 each), which funds grantees with promising but relatively untested ideas. A panel of national experts is calling out schools for suspending students with disabilities at disproportionately high rates. Thsi is is wriat a learning-disadleb chilb often has to conteb with when atteqting to need a dook. Tjew ord sare n otsp aced cor rect ly. We spell wrds xatle az tha snd. These are samples of what people with dyslexia see when they try to read. Dyslexia, a developmental reading disorder, is the most common learning disorder, according to the U.S. National Library of Medicine. It hinders a person's ability to read, write and spell, regardless of their level of intelligence. A panel of national experts is calling out schools for suspending students with disabilities at disproportionately high rates. Kids with disabilities and students of color — particularly those who are black — are suspended at "hugely disproportionate rates" compared to white children, a trend which is fueling inequality in the nation’s schools, according to a report issued late last week. The analysis comes from the Discipline Disparities Research-to-Practice Collaborative, a group of 26 nationally-recognized experts from the social science, education and legal fields that’s housed at Indiana University. When it comes to student learning, many stakeholders focus on important learning supports, such as classroom technology, reliable high-speed internet access in schools, and educators who use technology as a tool to increase student achievement. But there's another important component that is sometimes overlooked — the human brain, and how learning impacts its structure and function. Children who use their hands to gesture during a math lesson gain a deep understanding of the problems they are taught, according to new research from University of Chicago's Department of Psychology. Previous research has found that gestures can help children learn. This study in particular was designed to answer whether abstract gesture can support generalization beyond a particular problem and whether abstract gesture is a more effective teaching tool than concrete action. Even as President Barack Obama called for virtually no change to special education spending in his budget proposal, members of Congress are pressing forward with efforts to fully fund the program. A bill introduced this week with bipartisan backing in the U.S. House of Representatives calls for increases in spending over the next decade in order to bring special education up to a level known as "full funding." A similar proposal is expected to be introduced in the U.S. Senate in the coming weeks, sources say. Advocates for children with reading problems caused by dyslexia say they're frustrated the issue isn't getting attention from state lawmakers. GOP Sen. Roger Chamberlain of Lino Lakes figures there are up to 135,000 students in Minnesota public schools afflicted by dyslexia, in which the brain struggles to distinguish characters and sounds. His bill would provide as much as $2,000 in tax credits to cover 75 percent of the cost of private tutoring for children with the disability. Licensed teachers trained to diagnose and treat dyslexia would be eligible for tax credits toward their training. While states are being asked to change how they evaluate their special education programs, the U.S. Department of Education also plans to change the way it interacts with states, Michael Yudin, the acting assistant secretary of the office of special education and rehabilitative services, told state board leaders gathered for a legislative policy forum. t's become the new buzz phrase in education: "Got grit?" Around the nation, schools are beginning to see grit as key to students' success — and just as important to teach as reading and math. Experts define grit as persistence, determination and resilience; it's that je ne sais quoi that drives one kid to practice trumpet or study Spanish for hours — or years — on end, while another quits after the first setback. What keeps students motivated to learn? Educators have lots of ideas about how to improve education, to better reach learners and to give students the skills they'll need in college and beyond the classroom. But often those conversations remain between adults. The real test of any idea is in the classroom, though students are rarely asked about what they think about their education. A panel of seven students attending schools that are part of the "deeper learning" movement gave their perspective on what it means for them to learn and how educators can work to create a school culture that fosters creativity, collaboration, trust, the ability to fail, and perhaps most importantly, one in which students want to participate. Should students be grouped by 'content level' instead of by grade? A California school district is grouping students by "content level" instead of grade. The model is based on the idea that students learn at their own pace and should advance when they have mastered the material. So, is content-based learning a good idea? Former high school academic dean Jedidiah Bila says the new plan means students have different lesson plans and more individualized learning. One of the two state consortia developing exams aligned with the Common Core State Standards is giving itself an additional week to iron out any glitches before field-testing begins. The Smarter Balanced Assessment Consortium, which counts 23 states as members, had planned to begin field-testing March 18. Schools will now begin the process on March 25, according to a consortium official. Joe Davenport's family had to get him privately tested and identified with dyslexia years before his school district would come to the same conclusion and provide him with the educational services he needed. "In first grade, we knew something wasn't quite right," his mother, Lisa Davenport of Durham, said during an interview. "But his teachers kept saying he was doing fine." Bill Gates is rallying teachers to support an embattled cause, the Common Core State Standards. At a speech Friday afternoon in Washington, D.C., the Microsoft co-founder is lending his voice to save the standards. According to prepared remarks provided to The Huffington Post, Gates told educators at the National Board for Professional Teaching Standards' Teaching and Learning Conference that the Common Core is the key to creativity for teachers. He also charged that the controversy around the Core "comes from people who want to stop the standards, which would send us back to what we had before."